Swordfish is an important fishing resource for offshore longline fisheries. South Africa is among the countries exploiting this lucrative resource with its domestic longline fleet. Fishing pressure is high in the south west Indian Ocean (SWIO) and the IOTC recommends that the southwest region continue to be closely monitored and that research on movements be developed to assess the degree of residence of individuals in that region. Electronic tagging was performed for that purpose. The hypothesis of a sub-stock at the regional level cannot be discarded (although not presently supported by the IOTC) and needs to be investigated using different markers or approaches. The most direct approach to assess the degree of residence of swordfish in the SWIO is electronic tagging, by depicting the movements patterns over periods of several months. South African and French researchers undertook in 2011-2012 the first successful deployment of PSAT’s (Pop-up Satellite Archival Tags) on swordfish in the South West Indian Ocean..
Fourteen longline-caught swordfishes were tagged with PSATs off the coast of South Africa and East of Madagascar. Although post-release mortality rates were high, five fishes (36%) yielded datasets longer than two months. Fish condition based upon visual assessment or duration hooked on the longline was a poor indicator of release success. Because of limitations in depth data released by the tags, vertical movements could only be investigated on four swordfish. They all depicted diel behavior, with deep (shallow) swimming during daytime (nightime). Basking behaviour was not observed as all fishes stayed below 8 m of water depth. Bathymetry and moon phase did not seem to influence diving depth, but dives seemed to be restricted by a temperature ceiling of ca. 8°C. Maximum and minimum water temperature encountered by the fish generally matched those found in previous studies around the world. Diving patterns did not change with average swimming speed, but longer presence in shallow waters during faster swimming was observed in one fish. All swordfish remained within the South Western Indian Ocean region whilst one fish crossed the 20 degree East boundary twice, indicating that there might be a link to the Southern Atlantic stock. Horizontal movements were reconstituted for the five swordfish with position estimates refined by minimizing the bias between the temperatures-at-depth of the tag and those of the NCEP-GODAS model. Within the timeframe of the experiments, the three fish tagged in the South Mozambique Channel (SMC) were found resident, the one tagged off the south coast of South Africa returned near the tagging location, whereas the fish tagged from East Madagascar performed a direct movement of 1400 km into the SMC. When analysed in parallel to fisheries data, the horizontal movements showed by those tagging experiments (still scarce) suggest that the Mozambique Channel might be a prime habitat for Indian Ocean swordfish population and would deserve a particular attention in terms of spatial management. 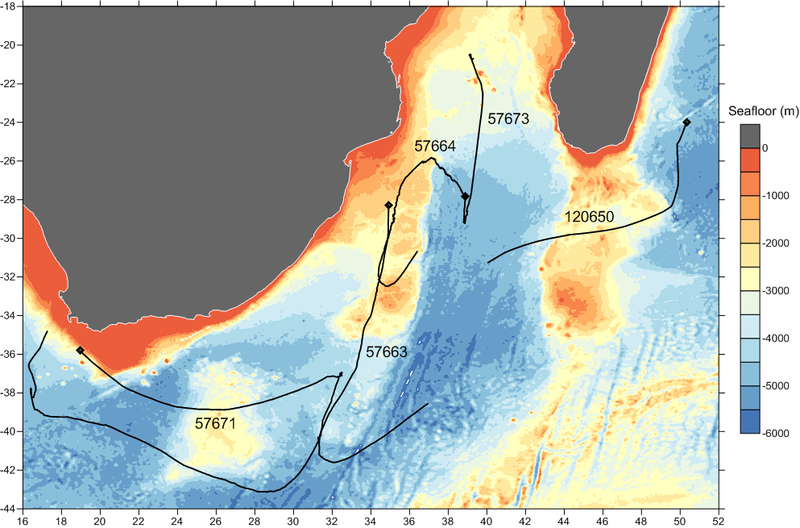 Horizontal movements across bathymetric features of swordfish tagged with pop-up archival satellite tags between the 16th October 2011 and 24th January 2012. The diamond indicate the tagging location. The pop-off location happens at the end of the track.